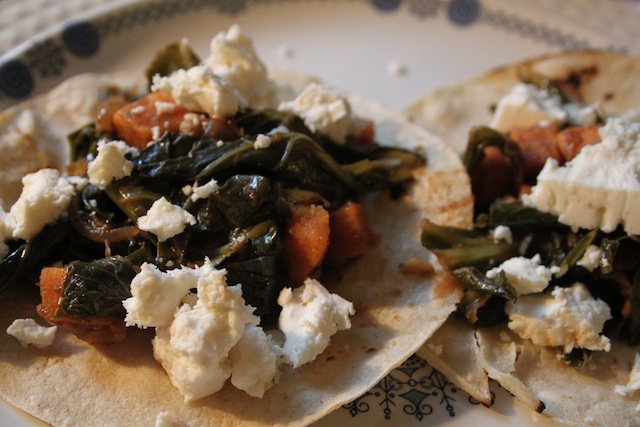 Doomsday Dinner: Sweet Potato & Collard Tacos – Eat Me. Drink Me. I figured I’d go out with a bang. Something simple and celebratory that said, “Good food is a good life” and “I’m really tired from work” at the same time. 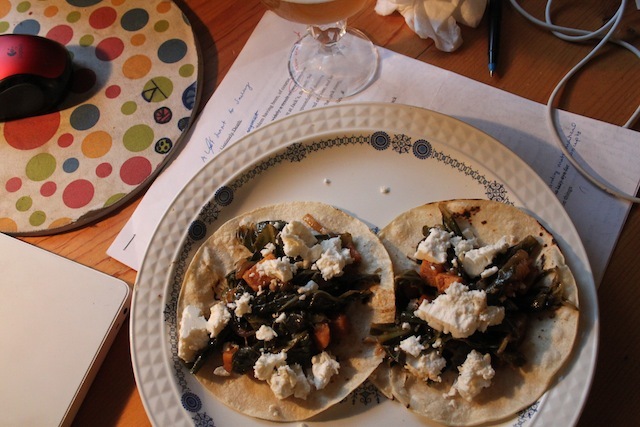 It was time to dig through the pantry for cans unopened, vegetables unused, ideas unexplored. I found harissa. I thought: cinnamon, sweet potato, collards. I played Adele very loud at the inconvenience of my neighbors. I sang along even louder. I thought, I have yoga-d, I have showered, and now I am cooking in the warm light of my kitchen. This is as ready as I’ll ever be to meet the hereafter. Assuming the hereafter is upon us in the next twenty minutes. I remembered that when I was doing yoga, the rooster crowing at five in the afternoon was a sign. A frantic and unheeded sign. But now, with the sweet potatoes softening in a bed of onion, garlic, cumin, harissa, and cinnamon, I remembered also that the rooster starts to crow at three in the morning and crows, like sick clockwork, seven times in a row every nineteen minutes apart, until late in the afternoon. And by the end of the day his crows are like death throes, implausibly persisting croaks. And before, I had felt the rain to be ominous, wet foretaste of horror. Now, it brought a cool evening breeze through the window and a calming patter. I remembered that I like rain. I snapped open a bottle of Weihenstephaner, my right now favorite wheat beer. The apocalypse postponed itself, I think to give me time to really taste crisp wheat and honey, blue sky, the remembrance of bananas. I remembered that I don’t like bananas. Two tortillas grilled on the gas stove’s open flame. Collards just simmering into a spicy tomato-laced harissa sauce. Crumbled feta. Everything wrapped in the tortilla. I ate and drank and waited. And as rain calmed away into cool spring night I forgot to wait and simply sat, listening to the sound of children playing somewhere on the sidewalk and lovers whispering carelessly over a bottle of wine, birds twittering, the rooster crowing his death groans. And as I forgot the fear of fire rain splitting the sky in half and earthquakes and floods, I remembered what I had always known, that the only frightening thing about death is the time we waste in worrying about it. Heat olive oil in a skillet. Soften yellow onion and garlic in the oil. Add sweet potato, cut into cubes, and sauté until sweet potato is almost soft. Season with cumin and salt. Add harissa paste and enough water to cover the base of the skillet. Cook until sweet potato is soft. Add tomato paste (or salsa or sauce) and splash of rice wine vinegar. Simmer briefly. Add collard greens, washed, trimmed, and ripped into chunks. Cover the skillet with a lid and simmer until collards are soft. Stir frequently, adding water or olive oil when sauce begins to stick. Season to taste with salt. Heat two corn tortillas over gas burner (or in a skillet if you have an electric stove). Top with collard-potato mix and crumbled feta cheese.